A key finding from our research into Thailand’s relations with China and the US, published recently as a report entitled Tipping the Balance in Southeast Asia? : Thailand, the United States and China, is that Thailand’s view of China switched dramatically from foe to friend in 1979. That was the year Vietnam invaded Cambodia, and looked as if it would incorporate its southern neighbour permanently as part of a Vietnamese-controlled Indochina Union. Thailand distrusted China at this time; China had supported the insurgency of the Communist Party of Thailand (CPT) in the previous two decades, with the CPT waging a vicious insurgency to defeat the Thai military and overthrow its monarchy. In 1975, the Thai military was initially opposed to establishing diplomatic relations with Beijing. But after Deng Xiaoping’s audience with the Thai royal family in Bangkok in late 1978, and the invasion in 1979, China ceased its support to the CPT. Instead China began to work with Thailand’s military to supply arms to Cambodian resistance forces sheltering on the Thai-Cambodia border. 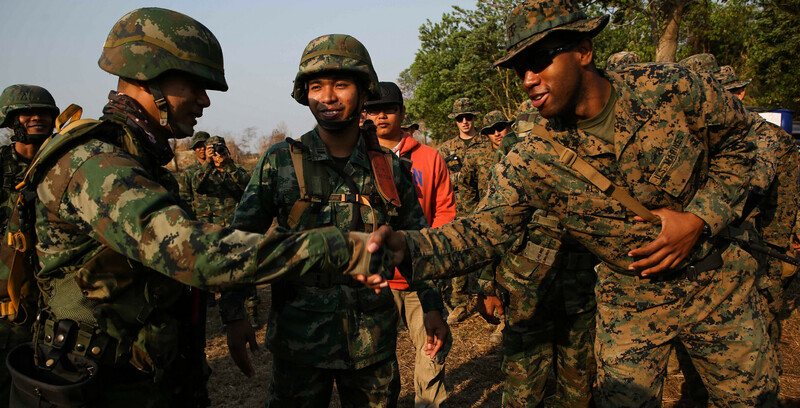 By the time a decade of cooperation had passed, the Thai military’s view of China had flipped. To a certain extent, this image has remained, offsetting concerns about China’s growing military power. Our surveys of almost 1800 Thai military officers over the last three years found that the vast majority view China as a country on which they could rely for protection against military threats. Like the Schrödinger’s cat in quantum physics, both dead and alive, Thailand views great powers as simultaneously threats and allies. Thailand’s perception of the US is conflicted. While Thailand, like Australia, is a treaty ally of the US and continues to see the US as a country that it could rely on for protection, it also is wary. Due in part to knowledge of US propensity to use force against regimes it does not like and compounded by awareness of the current military government’s illegitimacy, the Thai military presently sees the US as the great power most likely to be a military threat. China is rated second (admittedly, this view of the great powers is within an overall view of regional security that sees non-traditional security threats such as climate change and transnational crime as more serious than military threats from great powers or neighbouring countries). More broadly, our research, the largest and most empirically-grounded survey of Thailand’s most important foreign policy institution in several decades, also clears away a number of other myths about Thailand’s strategic and geopolitical positioning. One myth is that Thailand’s view of China is shaped by its Sino-Thai population. Although Thailand is one of Southeast Asia’s most successful examples of assimilation of Chinese immigrants and one third of our respondents had some Chinese family background, Sino-Thais and non-Sino Thais showed virtually the same attitudes on questions of threat and foreign policy. In this respect Thailand is like Singapore: ethnicity does not determine strategic outlook. Another myth is that Thailand’s geopolitical alignment is indicated by its defence purchases, such as its recent decision to acquire submarines from China. Rather than confirming geopolitical alignment with China, our research suggested that price and availability are bigger factors. Thai military officers would prefer to buy US equipment, but the higher prices and the conditions the US imposes are significant disincentives (for an example of the latter, the US once agreed to sell Thailand AMRAAM air-to-air missiles but only on the condition that they would be stored in the US). Perhaps our most important finding is while Thai officers recognise that China’s influence is now equivalent and even greater than the US, especially since China became Thailand’s largest trading partner in 2012, the US-Thai alliance is still likely to remain healthy into the future. There are two key reasons for this. First, language and doctrine favour the US. The number of Thai military officers with English-language proficiency dwarf the number of Mandarin-speaking officers. This preponderance is reinforced by the US and Australia providing far more foreign training to Thai military officers than China. The outcome is that while Thailand and China may have commenced combined air exercises, the levels of intimacy and sophistication are far beneath those of Thai-Australian or Thai-US combined air force exercises. A second key factor is Thailand’s strategic culture. Many in Thailand’s foreign policy elite see the current multipolar era as resembling that of the 19th century, when European great powers competed. In that era, their revered King Chulalongkorn preserved Thailand’s independence, it is believed, by ensuring that close relations were held with all great powers. We don’t want the Chinese to do what they want, that’s why we appreciate the US coming into the region to be another big guy on the block. To make sure the one big guy we have is not pushing people around. If there is any difference between today and that era, it is the existence of ASEAN. Many Thai military officers hold strong beliefs that, like a proto-great power, ASEAN is important to Thailand’s future security and prosperity. Thai attitudes may hold lessons for Australia, demonstrating that a benefit of real cooperation in a serious situation can be an unexpected change in trust. Cambodian military politics, Nauru’s ABC ban, and “Patrons of Mateship”: the week that was on The Interpreter.